As many are aware at Rice, my stance on compostable products made of corn and sugar are certainly better for the environment than bio-degradable, plastic, and of course styrofoam. However, I have a philosophical problem with turning any “food” substance into a plate, cup, or bowl. There are really two solutions from my investigation... The re-usable container by GET Enterprises is a great concept that I have endorsed, but will not implement until 2011 for various logistical concerns I have. I won’t bore you with details here… The basic premise is that university dining purchases the containers and then “rents" them out for to-go use. If they are returned, a full credit is given. If they are exchanged for another; no problem... If they don’t come back, the rental fee pays for the replacement cost. There are many variables at universities that my inhibit the use of this container and still have to rely upon disposable products. This is the second solution I referred to. Several months ago, I was privelaged to speak with a team from Dartmouth school of Business while they were here at Rice presenting their product for the business plan competition. What they have is disposable plate made completely of dried palm leaves. 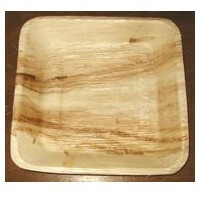 This is not only an elegant piece, due to each plate having unique designs because of the variations in palm leaf striation, but it is compostable and NOT made of a food supply, but rather a fallen; wasted leaf product. Really cool in my opinion… I fully endorse this product and have done so officially for their next big business plan competition. Good luck guys!